Note to my husband: Yes, sweetheart, I know Maryland is a border state. But it’s below the Mason-Dixon and far enough south for your Yankee wife to consider this “The South”. Ahhhh…. autumn! The best time of the year, in my humble opinion. I’m a New Englander, and this southern heat kills me each year. I look forward to cool mornings and evenings with the same eagerness as a 5-year-old does to Christmas. Yesterday morning, while brushing my teeth, I noticed an odd burnt aroma. It took me a few minutes to figure out that it was the heater kicking on for the first time in almost six months, and when I did, I danced a jig. Literally, I danced a jig. The kids thought I was nuts. 1. It’s sweater weather! There is nothing like wrapping yourself in a soft, well-worn sweater. It’s like a hug from an old friend. Ditto for flannels and hoodies, and for that comfy down blanket on your bed. And let’s not forget the feeling of donning your favorite jeans or cords. If you’re anything like me, it’s a feeling of relief at not having to worry about shaving your legs! 2. Football. I don’t know why, but I love love love watching a bunch of guys grapple over a piece of leather. Maybe it’s because it brings back memories of watching the games with my grandpa each week, or maybe it’s because it ignites my competitive spirit. Whatever the reason, and despite my chosen team’s general suckage (I know it’s not a real word, but it aptly applies to Miami most years. ), football is one of the great loves of my life. There’s only one thing better than watching the pros duke it out each weekend–watching my son and his team play! 3. Apples, pumpkins, and root vegetables, oh my! Fall harvest food figures into most of my recipes this season. It’s hearty comfort food at its finest, particularly the soups, stews, and chilis that are at the top of our menu at home. This is also the time of year when you get Pumpkin-Spiced Everything. Dunkin Donuts offers a killer Pumpkin Coffee (and apple cider donuts! ), and Starbucks boasts its Pumpkin Spice Latte. And lest I forget, there are also the numerous varieties of pumpkin- and harvest-themed brews. 4. “Every leaf speaks bliss to me, fluttering from the autumn tree.” Emily Bronté summed it up perfectly! I am fortunate to live in an area with tree-covered mountains that are set ablaze come the beginning of October. It’s impossible to describe just how awesome it is to see the brilliant oranges, flaming reds, and radiant yellows that bedeck the scenery. And jumping into that giant leaf pile? Does it get any better than that for a kid? 5. Halloween. It’s impossible to choose which I love more–Halloween or Christmas. There’s a longer season to enjoy Christmas, but Halloween is just plain fun! Then again, I really love spooky and scary things. This year, I’m putting more of an emphasis on creepy in my decorations, and leaving the kitsch to the kids. I also get a thrill at helping the kids plan their costumes. Now that they’re older, their choices tend to gravitate towards the more commercial. But I anxiously await the turning point back to more original, homemade ideas, such as Beck’s request to be Major Tom (a lá David Bowie’s song). Edgar provides just the right amount of creep factor to the house. There are actually many more things about fall that I just love, including my anniversary (October 20), but I’ll keep it to just five for now. How about you share your favorite things about fall? Or if you prefer another season, tell us about it! Meanwhile, enjoy that sweater and watch out for errant twigs in the leaf pile! 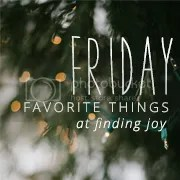 This post is part of finding joy‘s Friday Favorite Things. Click on the graphic below to see a list of participating bloggers and be sure to spread a little blog love of your own! Follow on Twitter with #fridayfaves. I had to edit this post to include a shout-out to Katie at Loves of Life blog, who designed this perfect Fall Bucket List. Get thee to her site and print out your free printable! « Five on Friday: Let’s Get Cooking! I can so relate to what you feel about Autumn…..except for the football stuff…. and I live in Atlantic Canada!! I love the warmth of summer but the cool nights and crisp mornings are so invigorating!!! I am definitely more productive during this season. I think you’re right, it’s the cool air being so invigorating! I love the same things about Fall, except the Halloween thing. Too much candy and creepy. Living in FL, I really miss sweaters and leaves! It doesn’t get cool here until Nov. and then it’s only in the 50-60s. I miss the seasons! Boots boots boots!!! It’s the return of BOOTS!!! Except I don’t have any good pregnancy boots (ones that you don’t have to bend down and fiddle around with to put on, or that don’t have a crazy heel) so I guess yay horror movies and apple cider!!! Yes! I just wish my calves weren’t to thick to wear knee boots. Love how they look with skirts!